This house is a classic example of Second Empire style, often called Mansard from its distinctive roof shape. 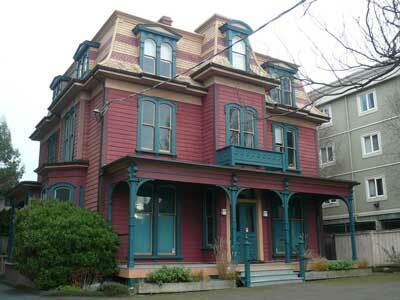 It is among the last remaining residences of this style in Victoria. It is a symmetrical three-storey building. The steep slope of the variegated, shingled Mansard roof has two bracketed, pedimented dormers with paired round-arched windows on the front and sides; the rear has one pedimented dormer and a small flat-roofed dormer. On the left side is a shallow square bay above a deeper angled bay, over which there is an angled balcony. Beyond the bay is a flat-roofed porch with paired square posts. On the façade there is a projecting central square bay with a pedimented dormer in the roof which has a single arched window. The main entrance is in the lower bay. The full-width front verandah above the entrance is supported on square single posts with brackets. There is a small balcony on the verandah above the entrance. All the paired windows below the roof have segmental arches. The cladding is drop siding. There was originally iron cresting on the perimeter of the roof and on the balconets which were on all the roof dormers with the exception of the central front dormer. The front verandah had been removed, the side porch enclosed, and the house covered in asphalt shingles for decades. In 1958 it was converted to 14 light housekeeping suites. In 1992 architect John Keay & Associates acquired the rooming house and gradually rehabilitated the interior, converting it into offices. The asphalt shingles were removed, and the house was painted in a historic colour scheme. In 2008, after restoring the full-width front verandah and its upper balcony, Keay and team won a Hallmark Society Award of Merit for their rehabilitation. Trebatha, which cost $8,000, was described in the Colonist Holiday Number, Jan 1888, as a “beautiful villa residence.” In 1896, Edward Mallandaine, Jr. as agent for the owner applied for the plumbing permit; he signed as “architect”, but it is not believed that he had designed it a decade earlier. 1887-1909: Dr. Thomas Joseph Jones (b. Toronto of Irish stock 1844-1924) married Susanna George (b. Cornwall, ENG, 1841-1908) in 1864 in Bowmanville, ON; her family came to Canada in 1850. Dr. Jones, a dental surgeon, practised almost to the day of his death. He had offices in St. Catharines and Toronto before coming to Victoria in 1884; by 1890 he had the largest practice in the city. A strong promoter of BC’s first Dentistry Act in 1886, he was the first president of the BC Dental Association. Jones was vice-president of the National Electric Tramways Co, which installed Victoria’s first streetcars. As president of the Canadian Club of Victoria he was the first to allow women friends of members to attend lectures. According to his obituary, “he has often been called the ‘Father of Liberalism’ in this province, owing to his staunch advocacy of Liberal principles.” VDC 1-1-1924. Their son Thomas Henry “Harry” Jones (b. Bowmanville, ON, 1865-1925) was also a dentist practising with his father by 1891. In the 1901 Canada Census, Harry was enumerated at both Trebatha and at his own residence on View St. The senior Joneses had an English gardener and Chinese servants, an unnamed 14-year-old girl in 1891 and in 1901, a 22-year-old male cook, Kee Ah, who came to Canada in 1898. Thomas’s sister Jane lived with them as did his niece or cousin, Jane “Annie” Webster (b. Port Hope, ON, 1856-1933). She and the Joneses were Episcopalians. Susanna died suddenly at home aged 77. In 1909 Dr. Jones married Annie Webster in Vancouver, and they moved into a new house, Dundalk, at 1171 Rockland Av, Fairfield. 1910-16: Elizabeth Webb (née Isaacson), widow of William John Webb, ran a boarding house here. They had married in Victoria in 1904. 1918: The house was vacant. It is understood that later in the year the house served as an emergency hospital during the Spanish Influenza epidemic. 1920: Robert Wescombe, bricklayer, and Harry Wescombe, an apprentice at Marine Iron Works, which was owned and managed by Andrew Gray (1135 Catherine St, Vic West). 1921-1939: CNR engineer George Walton (b. Darlington, Co Durham, ENG, 1870-1939) and Ruth Ellen (née Feldon, b. Stourbridge, W Midlands, ENG, 1872-1959) married in Victoria in 1898. 1941-52: Labourer William Henry Caton (b. Manchester, ENG, 1885-1961) and Louisa (née Phillips, b. Manchester, ENG, 1886-1962) ran it as a rooming house. The Catons had run an auto court in the late 1930s. Living with them was Arthur Caton, a mechanic at Louis Nelson’s garage & gas station, 810 Johnson St.